Make your favorite yogurt or sour cream dip. Let your parent cut cucumber in half. Scoop out melon with melon scooper and cut into small pieces. Mix with yogurt dip and fill cucumber with it. Add some raisins or dried cranberries to the top. Print sail pattern and cut out sails. Cut small slits into the sails as indicated on sails and push wooden skewer through the holes. Trace and cut flags out of red craft paper and glue to the top of wooden skewers to finish the masts. 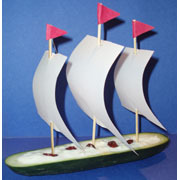 Push into the cucumber to finish your Mayflower. This makes a great Thanksgiving snack and decoration. Serve with crackers.